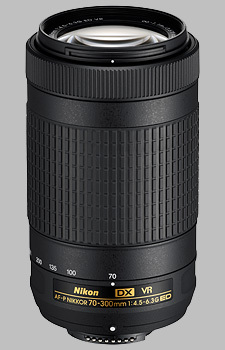 (From Nikon lens literature) Uncover exciting new photo and video opportunities with this exceptional super-telephoto zoom lens featuring Nikon's Vibration Reduction (VR) image stabilization for blur-free results. Optimized for compact DX-format DSLRs, the AF-P DX NIKKOR 70-300mm f/4.5-6.3G ED VR picks up where your 18-55mm lens leaves off to bring distant action within reach. Capture sports, wildlife, concerts, landmarks -- any faraway subjects -- with phenomenal clarity and precision. But this lens isn't just about getting closer. Its superb optics and telephoto field of view produce beautiful portraits with softly blurred backgrounds. Add VR image stabilization and quiet autofocus pulse motor (utilizing stepping motors), the AF-P DX NIKKOR 70-300mm f/4.5-6.3G ED VR is an ideal choice for video recording and stills even when handheld. **The lens will default to VR on when attached to models released prior to the D3400: D3300, D3200, D3100, D5500, D5300, D5200, D7200, D7100, D7000. These cameras will also require a firmware upgrade to access the menu to turn off the VR. Small, light, and sharp! And cheap! Delivered with no lens hood, no lens bag, and no functional rear lens cap. Very plastic! I've gone through a few 70-300 lenses the last few years, beginning with the AF-S 70-300 VR, and now I have two, the 70-300 CX and this new little wonder, the Nikon 70-300mm f/4.5-6.3G ED DX VR AF-P. The first feeling you'll get is that this a barebones design, as the lens is delivered without the lens hood, or a functional rear cap, and it lacks all kinds of switches, not to mention that the lens is mostly plastic, even the mount is plastic! Weighing in at around 400 grams, this is a lightweight class lens, so my hopes were not that big. Found a replacement lens hood on the net, so that was easily fixed, and spare rear lens caps I had, so that was quickly fixed! Then, to my great pleasure, shooting with it proved to be an utter delight. And even with a Kenko 300 Pro 1.4X TC on it (as pointed out by other reviewers), it locked on with no great problems, when used on my D7500. Seems to be designed for fully open aperture, as sharpness then was not an issue. I would have loved a limiter, but as this is a low-budget offering, whom am I to complain. Even the bokeh seems decent, no tendency to producing onion rings. I plan to try it side by side with my 70-300 CX, are they really equally good? With an FT1 adapter on their weights are almost identical, but the CX version has a limiter and is an upmarket version for Nikon 1 cameras. Time will tell, and I'll be updating this review when I know! Very sharp, instant AF, amazing VR, priced right. Entry level construction and handling, some flare. I rented this only to see if it's time to retire my good, old 70-300 VR FX. Summary: Yes, I'm switching. I compared the two lenses on my D7200 and D7500s, taking hundreds of identical pictures and then placing best-of-three in each group side by side. These shots, all hand-held at f/8, varied from 1/3 second, ISO 800 indoors to bright sun outdoors. In every case, this DX lens outshone the older one. For sharp images up to 300mm with excellent color rendition and contrast, and great VR for relatively slow exposures in low light, there's no comparison. I no longer have an FX format camera. With VR like this, who needs it? I can shoot with this lens at relatively low ISO to eliminate any FX noise advantage. Because I was only seeing if I wanted to buy one of these lenses, I probably didn't take all the types of pictures I might eventually take with it, and I don't pretend to have conducted a "scientific" test. I leave the latter to the experts. But it didn't take long for me to ship my FX out for sale and buy one of these new ones. I know I didn't make a mistake, and the forthcoming reviews will confirm that. I now have two of these, on in my "here" bag and one in my "travel" bag. I've now tested one of them on my D7200 with a 35mm extension tube to see how well it might do for closeups. Well, it only seems to work reasonably well up to about 120mm. This is no replacement for one of my 40mm macros or the 85mm macro that's coming soon, but it does work fairly well. This lens did something that's new to me: .NEF files (which is all I ever shoot) wouldn't open in Nikon View NX2, and generated an error message in NX-i, if they originated in my former D7100 with Auto Distortion Control set to ON. But the D7200 and D7500s, with the same or similar firmware download, produced .NEF that were fully functional in Capture NX-D with ADC ON. Apparently, the current D7200/7500 firmware includes ADC data for this lens, but it didn't input such data on the D7100, which I've now sold. The solution for images from a D7100 for Capture NX-D would be to set Auto Distortion Control to OFF. That would make D7100 .NEF files using this lens fully compatible with Capture NX-D.
No, this lens is no substitute for my 80-400 G, which lives in one of my D7500 kits. But for all around longer tele use it's very useful as a sidekick to my "here" 24-85mm walkabout lens. It works well with my Kenko Teleplus Pro DGX 1.4x teleconverter, on my D7200 and D7500s, which focus with it behind this lens all the way down to net f/9 (f/6.3 x 1.4), which surprised me. Yes, the contrast has to be good, and in some cases where was a bit of searching. But it did focus even in low light for good 1/4 second exposures, and very easily for normal outdoor shots. I think this small aperture focus is because the lens is so sharp. The resolution with this lens and TC is as good as I've ever gotten with a teleconverter, except with the 80-400 G and 200-500, and Nikon TC. I also took about 100 shots comparing this lens with my 55-300, now sold. At 300mm, images from this lens are much sharper than the 55-300's. But up to about 200mm their image quality was pretty close. I don't care that I can't turn off VR, because I never use a tripod, nor do I care that there are no switches on this lens, as manual focus override is so simple. I don't like the "greasy" feel of the focal length and manual focus override ring turning. But most recent entry level lenses have that, and I'm getting used to the others I have. At least turning the rings is very smooth. Also the light weight of the lens, compared with the earlier FX version, takes some getting used to, especially in breezes. But I think I can handle that. It is a plasticky lens. So...I'll be careful. I recently noticed that if shooting with this lens toward the sun, or even with the sun alongside the subject in dusty areas, the images suffer a bit from something like flare. The "glow" is actually there if you look at the subject without the camera, but the lens doesn't seem to do anything about it. I don't know if a CPF (which I don't have for this lens diameter) or any other lens by itself would eliminate such "dust flare" entirely. Anyhow, I'm now more careful where I point the lens. I now have two of these lenses, one to use with my D7200 and the other for my travel D7500. They're identical optically, but zooming on the more recent one is firmer up to about 100mm and then eases up toward 300mm. No problem with that, but it again shows that these really are cheap, entry level lenses. The bottom line is that this certainly isn't a pro lens, and even if Nikon had added a metal mount and increased the price it still wouldn't be a pro lens. But for a guy who's been shooting Nikon SLRs for going on 50 years, it definitely confirms that Nikon is still in the front rank of lens optics technology.